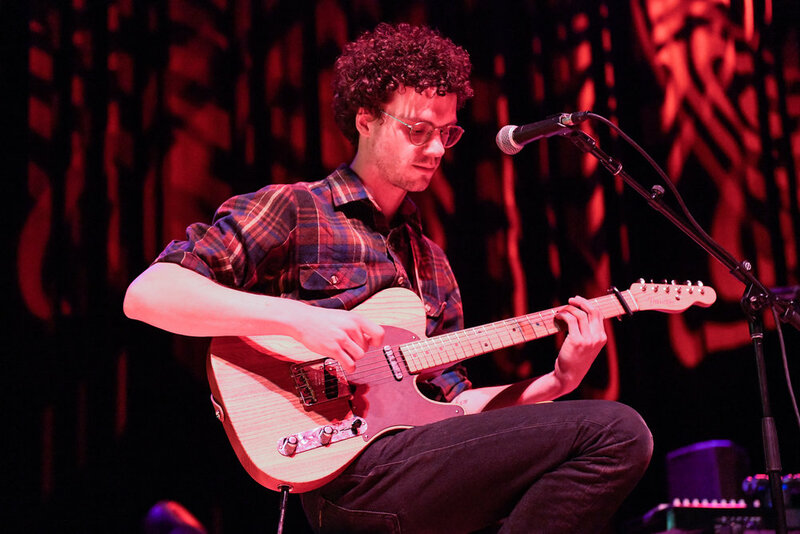 On March 28, the bands Whitney and SALES held the stage in Goldstein auditorium at Bandersnatch, the University Union’s event to bring Indie groups to campus. Before they went on, Jerk Magazine and a group of other reporters had the chance to sit down and talk as a group with the performers, each asking one question per publication. What music are you listening to right now? You’ve also covered “Southern Nights” and “You’ve Got a Woman,” so what makes you want to cover a song, and are there any songs you’re looking to cover in the future? Max Kakacek: We listened to Staind today. Julien Ehlrich: As of the last three hours, our tour manager found a CD booklet binder, he found one on top of the dumpster outside his house and just grabbed it because we have the CD player in the van. We were listening to Moby today. JE: We did listen to Radiohead, and there was a bunch of Counting Crows on it, but we didn’t listen to that. We’re actually listening to Simon and Garfunkel a little bit, some of those songs. We’re also writing, so we don’t listen to much new or even old rediscovered music when we’re writing, just because we’re focused. Since you began touring, have you changed your music style or the message behind your music to cater more to your audience, or have you stayed true to the original style? JE: Yeah, staying true to the first record. We’re just trying to make music as honest as that, and then just naturally. Our style as musicians is kind of shifting because were getting older. Maybe we’re slightly more sophisticated when we write songs? But we don’t try to be, some of the moments that we’ve written on, the next moments are a little bit more thought out than the last record. What are your future plans, and what can we expect from Whitney? JE: We’re writing. We’re in full-blown writing mode. MK: We just spent two days in New York City in the studio with our buddy working on stuff. I think we’re playing one new song tonight. JE: Yeah, we’re playing one new song tonight. One of the main reasons why we said yes to this show was so we could fly to New York a couple days early and work with our friend Jake. MK: And like try the new material up here too. How do you feel that being an unsigned, independent band has impacted your experience touring and creating music? Jordan Shih: It’s been amazing. I wouldn’t want to have it any other way. We get to make all our own decisions. There’s a lot of responsibilities we have to take on but I like that. Some people like having a lot of hands, but that can be very difficult. I feel that if it’s a project you care about, you have to work on it yourself. There were record labels reaching out to us, and when they did, they didn’t really have much to offer. It’s been really challenging but fulfilling. Lauren Morgan: It started out because no one was really offering us anything, and we always made music as a constructive pastime. We had jobs and we loved making music, and when we started putting out, everyone was like “Get on a record label. Blah blah blah,” but no record label was hitting us up. We started doing things ourselves, and it became super fulfilling, starting to know our worth. Now, our hands are in it, for better or for worse. It’s really cool. JS: It’s cool being able to play a show for people you know know about you because they discovered you by themselves, not through a record label promoting us. It feels like the people that know about us genuinely like us. It’s very natural. Nothing manufactured. We never really toured with more than three or four people. We keep a slim team. You guys have had your EP and LP and now a few recent singles, so how has your sound and style evolved since the first EP and what do you see your sound being like in the future? LM: I think our style has evolved because our equipment has gotten better. We’ve used the money we’ve made from touring to buy cool stuff and learned how to use it. We now have hardware like a big compressor and a nicer interface. We started out with this dinky interface with two inputs. JS: The EP was recorded with a hundred-dollar interface and one mic, same with the LP. Only the recent singles were recorded with nicer stuff. We’ve learned a lot more as well, so it’s not just the equipment. You’re always learning how to record and mix better. LM: We’re having a lot more fun crafting songs and recording things and getting the best possible recording we can get but still keeping the artifacts we find. We do everything —mixing, mastering — so it’ll always sound like that, like us, but hopefully it sounds like we’re learning.